We have more people sleeping under our roof than ever before – 216 individuals. Here is a trip around the Lighthouse from last night. Recently Cliff, a long-time tenant passed away. The family requested that memorial donations be directed to the Lighthouse. Rainbow Cinema made a large donation in Cliff’s name as he had been employed there for over 2 decades, as well as other gifts from friends and family. From everyone here at the Lighthouse, our deepest sympathies go out to all those who knew and loved him. We will continue to house everyone in need of a home thanks to your support. To donate click the link here: https://www.canadahelps.org/dn/2762. ‘Matthew’ stayed in the Stabilization Unit for the first time this summer, after getting sick of sleeping on a park bench. Completely demoralized by the downward tailspin his life was in, Matthew was contemplating ending it all. After spending a couple of nights in the Stabilization unit, he shared his struggles with a case worker, Whitney, who encouraged him to maintain his sobriety and stay in our regular emergency shelter dorm. Matthew found hope and a reason to “quit the bottle”. When an apartment opened up at the Lighthouse, staff offered him his own place. He stayed for a short while, found a job, and then moved to be closer to his new place of work. He still comes back once a month to check in with Whitney and continues to discuss with her what he has control over in his life and what he doesn’t. He is also attending groups in the community and trying to make new friends. In February the Stabilization Unit helped 33 different people, with a total of 538 stays. On average there are 18 men and women, with some nights as many as 25 intoxicated individuals looking for a safe place to sleep. While the Stabilization Unit only has 20 beds, the Lighthouse has been trying to manage the amount of people hoping to stay here. 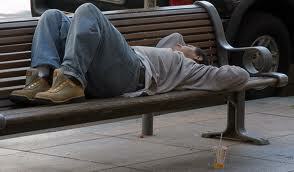 Some individuals come and go through out the night, using multiple beds. With the extreme cold in February, for some individuals extra mats were placed near the front desk so that everyone had a safe, warm place to stay, regardless of their sobriety. More recently, another staff member, Cameron has been connecting with ‘Leo’, a gentleman who had been staying in the Stabilization Unit since January. Cameron encouraged him to stay sober, and Leo was able to stay in the Lighthouse’s emergency dorm for two weeks. Unfortunately Leo fell off the wagon, ended up back in the Stabilization Unit and was talking about “giving up”. Cameron was able to share with him some of the opportunities and services that could help Leo with his addiction. The next day Leo decided to go to a Detox facility in Wakamow. Cameron was able to help him coordinate transportation and placement, so that Leo could begin life with a fresh start. There are many stories our staff share with us, conversations which lead to questions, solutions and life changes. The Lighthouse Stabilization Unit is a chance for caring staff to meet some of the most disaffected and transient members of our community. By forming relationships with them, they are able to help support changes in their lives.